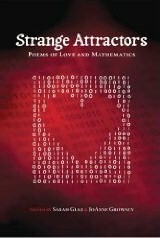 When I joined the River of Words readers to read poetry at the high school where I teach, I introduced myself by asking “What is that math teacher doing reading poems?” Strange Attractors: Poems of Love and Mathematics, edited by Sarah Glaz & JoAnne Growney, brings up similar questions for many readers. Both professors of mathematics, Glaz and Growney share an interest in reading and writing poetry, which led to the creation of this anthology. By modulo 50 she’s 30.
the ceiling floats away with a sigh. sunlight glinting where they’ve intersected. Mathematics is a human activity. Poets sometimes incorporate mathematics into their writing; and Mathematicians sometimes turn their hands to poetry. Once when I was talking to a group of parents about math, I put baskets of Legos out on the table. I imagined that, like children (or math teachers at a workshop), they would begin to play, to build with the legos. One group scattered the legos in clusters on the table. When I asked each group to describe what they had constructed, that table’s spokeswoman said, “This is my house, small toys scattered everywhere, waiting for me to trip and crush them.” The materials are on the table, and this anthology allows us to see what 142 (by my count) poets create. The strength of this anthology is that it looks at what both poets and mathematicians build with each other’s tools. Sarah Glaz and JoAnne Growney, have put together an anthology that readers with interests in either camp will enjoy and want to share. Carol Dorf’s poems have appeared in Moira, Feminist Studies, Heresies, Fringe, The Midway, Poemeleon, New Verse News, Babel Fruit, Edgz, Runes, Poetica, Responsa, The NeoVictorian, Caprice and elsewhere. She is a former editor of Five Fingers Review and the Barnard Literary Magazine. She’s taught in a variety of venues including a science museum and as a California Poet in the Schools. She now teaches mathematics at Berkeley High School.